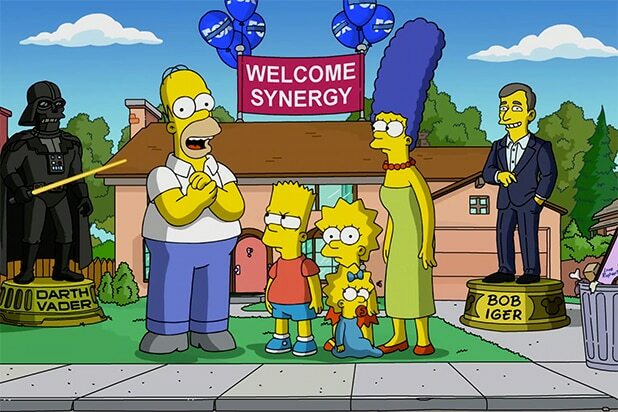 “The Simpsons” will have a new streaming home when Disney+ launches in the fall. As announced at Disney’s 2019 Investor Day on Thursday, the long-running Fox animated comedy will be exclusively available on streaming as part of the service’s library. The news was announced in an animated video featuring the show’s characters standing before a large “Welcome Synergy” banner and statues of Bob Iger and Darth Vader, while a framed photo of Fox’s Rupert Murdoch sits in the trash nearby. Disney+ is set to launch on Nov. 12 at a $6.99/month price point. At launch it will boast a number of Disney-owned titles including properties, like “The Simpsons,” which it acquired as part of its merger with 21st Century Fox earlier this year. Other originals confirmed for launch include the Marvel Cinematic Universe series “Loki,” “The Falcon and The Winter Soldier” and “WandaVision,” as well as an untitled “Rogue One” prequel, a “Monsters Inc.” series and “Diary of a Female President” from “Jane the Virgin” star Gina Rodriguez.